The formation of the committee – never mind the inquiry itself – was not without controversy. 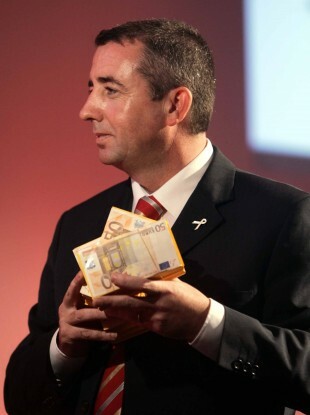 Labour's Ciarán Lynch, who will be heading up the inquiry. THERE HAS BEEN much talk and controversy about its formation, but the banking inquiry committee will meet in private for the first time this morning. The inquiry is due to hold its first meeting in private session in Leinster House at 10am where the 11 members – six government and five opposition – will hold initial talks on the terms of reference for the investigation into the collapse of the Irish banking system. “The Committee will be briefed on legal, procedural, administrative, logistical and communications issues. It will also hold a preliminary discussion on the development of a proposal to the CPPs (Committee on Procedures and Privileges),” committee chair Ciarán Lynch said. Once the terms of reference are agreed the CPPs of both the Seanad and Dáil will approve the inquiry proposal and finalise the membership. The meeting comes over a week after it was first scheduled to take place after a series of controversies over the initial membership delayed proceedings. The government came in for a barrage of criticism after it first failed to ensure it had a majority, then failed to remove a member, then added two members, then lost one member, and then informed the the remaining government members there would be no whip applied. The most recent member added to the Oireachtas committee was Socialist Party TD Joe Higgins, who stepped in to fill the role vacated by the independent deputy Stephen Donnelly after he quit over government interference. Prior to this there were attempts to remove Fianna Fáil senator Marc McSharry from the committee, after claims – later withdrawn – of a conflict of interest. The Government lost its majority on the inquiry when two Labour Senators didn’t attend a Seanad selection committee vote, leading to McSharry being added instead. Then when it failed to remove McSharry, the government added two of its own senators to ensure a majority. This led to a furious row between Fianna Fáil leader Micheál Martin and the Taoiseach and Kenny being compared to Hitler during a testy Seanad debate. The row saw Donnelly quit last weekend leading the government to state that it will not be imposing party whips on Fine Gael and Labour members of the inquiry. However some government members privately doubt whether this will actually happen in practice believing a ‘soft whip’ will still apply. The inquiry will be tasked with looking at political policy, regulatory structures and banking governance, Kenny said earlier this week. We have already set out the five key issues facing the banking inquiry before it starts. The inquiry was promised by the government after the conclusion of the trial of two former bankers at Anglo Irish Bank, who were found to have participated in an illegal lending scheme that involved €450m. The role of State institutions. It was this bank guarantee that led to several austerity budgets and the 2010 EU-IMF bailout. Although a number of investigations have already probed the banking collapse, including a report by the current governor of the Central Bank Patrick Honohan, this is the politicians’ turn to examine the issues and bring key figures before them into the public arena although such hearings are unlikely to take place until next year. The membership of the committee includes Fine Gael TDs Kieran O’Donnell, John-Paul Phelan and Eoghan Murphy as well as senator Michael D’Arcy. Labour is represented by the aforementioned chairman Ciarán Lynch and senator Susan O’Keeffe. Opposition members include Finana Fáil TD Michael McGrath and senator Marc MacSharry. Sinn Féin is represented by Pearse Doherty while Joe Higgins and independent senator Seán Barrett make up the rest of the membership. Email “After much controversy, the banking inquiry will meet for first time today (in private)”. Feedback on “After much controversy, the banking inquiry will meet for first time today (in private)”.